This afternoon on board the Sanctuary with Captain Dave, we travelled out to where the Asteria had some luck! 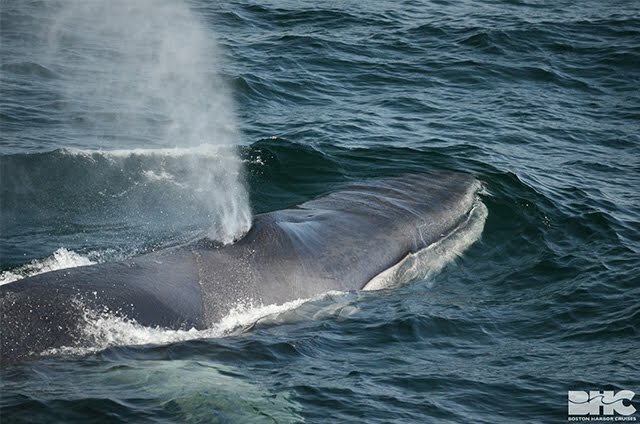 Thankfully, the fog had cleared from this morning and the visibility had opened up enough for us to find several scattered finback whales. We first spend time with 16BP08 who has a very unique dorsal fin with two distinct clips. This whale was travelling randomly around the area and took mostly 5-6 minute dives. This whale spent plenty of time at the surface catching its breath between dives, and passengers were excited to catch a glimpse at the whale’s chevron along its right side. We decided to check out the other whales in the area and were able to identify 16BP07 and 16BP13 as well! These two were surfacing at almost the same time, but usually a few hundred yards away from each other. I’d be curious to know if they were vocalizing at all below the surface to coordinate their surfacings. Upon closer inspection of my photos of 16BP13, you can make out his open eye just below the surface (see photo)!